Gregory Fortuin is the National Director of Employment Plus at the Salvation Army. He’s got a long history, from apartheid South Africa, insurance in Australia and New Zealand, South Africa’s Honorary Consul to New Zealand, Race Relations Conciliator in 2001 and 2002, and is on board of all of the big things in New Zealand. Kiwibank, New Zealand Post, ACC, the founding chair of Youth Suicide Awareness Trust, Prison Fellowship, National President of the African Communities amongst other things. Gregory: I was born in Cape Town, so the foot of Table Mountain. But, I grew up in a place called Paarl, and so for South Africans I make it very clear that I’m a Paarlander, which is 40 miles north of Cape Town. That’s the wine country of South Africa. With my dad, and his mum, and his brother had bought ten acres of land. That’s where I grew up, a place called Paarl. Oh, Paarl, of course, was made famous by New Zealand cricketers. Stephen Fleming, Dion Nash, Matthew Hart were all fined for smoking dope in Paarl and got suspended. The W. Indies, of course, thought they should’ve suspended the others for lying. Sam: It sounds like an idyllic place but I suspect it wasn’t. Gregory: No, not when I grew up. Paarl was typical of the real Afrikaner Dutch places. If you were wanting to see apartheid in its real pronounced, or strongest form, Paarl would be it. When the National Party won the election in 1948, my Granny said that if you were non-white you would’ve been pushed off the pavement, even if you walked on the pavement. Sam: You grew up- was it- classified as coloured? Is that how it was described? Sam: What impact did that have on education? Were the schools differentially resourced? Gregory: Yep, absolutely. Something like, in the sixties, it was the equivalent of about a 1,000 rand per capita for a white child, and about 200 rand per capita for a coloured child, and about 90 rand per capita for a black child. The Minister of Education said, in the fifties, that, “even the Bible tells us that they need no other education than to be hewers of wood and drawers of water.” They don’t need fancy qualifications, they just need to be good slaves. We actually had a whole curriculum for Bantu education and for subservient, slave-type education; to be good slaves. Sam: What did that do to you as a young person? Gregory: I also grew up in a conservative church environment. It was about, “you just go to school, and you don’t rock the boat, and you obey the authorities, and you obey your parents.” That’s it. That’s that. From nought until 16 and a half, when I matriculated, I was fairly submissive. It was only at the age 17, wanting to go and study at the University of Cape Town, which was a classified white university, and wanting to do medicine maybe for aesthetic reasons, but I had to apply to the Minister of Coloured Affairs for permission to go study at a white university. And then also to the university, who I knew took a quota of non-white or black students of about three to five every year. So, you’re also competing with the cream of all of the non-whites, so I didn’t get in. Yeah, it was … education was a tough thing if you weren’t white in South Africa. That meant you just had to work so much harder to achieve anything. Sam: Lots of the works that you’ve done subsequently has got a very strong social justice, community development ring to it. Was that always burning there somewhere? Gregory: Yeah, totally. In those churches I grew up in there was an old, illiterate man who, when I was quite bitter about not getting into university, was saying, “you better get over that ’cause you need to get yourself an education.” It took me a while to get over that, and I did some actuarial studies, and I did operation research studies. But, the promise I made to myself was I’d never, ever, put that on a CV or on a piece of paper. But, back to the old man. He was the guy who invested in our lives. My mum was 27 with three kids, four, six, and seven, when dad passed away. No insurance, no benefits from the government, etc. My mother didn’t have a formal education so left school at 13, worked in a handbag factory, and then she went to work as a nurse in a hospital. She trained herself. Those were the days you could train at the hospital to become a fully qualified nurse. She poured her life out in wanting to raise these three boys of hers. Other than mum and my Gran, if you rang my two brothers in South Africa any day, any time and say, “who was the person other than your mother and grandmother who had the greatest influence?” They would all say their old man, the illiterate guy, papa swan, who mentored us, and invested in us. It’s about paying it forward for me. When I was growing up apartheid South Africa one of the things I resented the most were the people in my community who were affluent coloured and black people, who could make a difference, who could help us, and didn’t. Now that I’m blessed in being in a position of influence and able to make a difference that finger that I pointed at others then is now very strongly pointed at myself. The drive to make a difference is because of that resentment as well. That if you’re in a position, then, for me, you don’t even have a choice. You should just make a difference. But, papa swan invested in us and this is about paying it forward. Sam: Seems like a good investment he made. Gregory: Totally, totally. It was time, it was sitting us down and having discussions with us about the future. We grew up on this small holding where eight other families lived. My dad bought the farmhouse. Eight other families came and bought their homes and stayed on our small holding. Sometimes mum would come home, having left 6:30 in the morning and arrive back home at 7:00pm, a bit tired, and one of the old aunties would come and complain, “these kids did this,” or “they did that.” Those were the days when we had no right of reply. Mum would immediately believe everything the old aunties say and so we would get our discipline. Sometimes mum would just be tired and she’d ring this old man, or she’d call for this old man, and he’d come sit us down and say, “your poor mum works so hard for the three of you,” and, “is this is the way you want to treat her?” Sometimes he’d just draw some tears from us. Sam: How did you get from that background into insurance? Gregory: When I matriculated in 1971 and wanted to go and study medicine, I firstly worked in a laboratory, testing raw materials and pharmaceuticals, etc. and thought, maybe, that was the path to medicine. Then I worked with a Muslim fellow at Peterson’s Pharmaceuticals, and he said to me, “did you see this national insurance company called Norwich Union? They’ve advertised and they’ve got something called ‘Glide Time Flexi-Time,’ where you can start any time up until 10 o’clock, and you can leave any time from 3 o’clock.” And we both thought that that was a fantastic thing in the seventies. That was the thing that sort of drew us to go for interviews. I then went and wrote a computer aptitude test at IBM because IBM was their supplier. I passed the aptitude test, and actually went for an interview to do computer programming for them. They came back and said, “look, we don’t have a vacancy right now in our computer area, but why don’t you try our superannuation area.” I found afterwards that, as a non-white, I didn’t quite fit the mould of being in the computer programming area, and so I started off in superannuation. This Muslim guy and I, we sat one side of the partition, while all the whites sat on the other side of the partition at Norwich Union in the early seventies. Sam: Even in a workplace like that? Gregory: Yep, totally. Within the workplace we were told to use the toilet facilities up on the eighth floor with the messengers. They used the weak argument of it’s government legislation. They just didn’t have the will to want to treat us as equal, ordinary human beings. But they did provide me opportunities. There was the Afrikaner Superintendent, who a year later, one of the Afrikaner ladies who was a supervisor for [Team Patricide], and I went and saw this guy who was my boss and said, “I can do that job, why don’t you give me that job?” He said, “yeah, but if I do then you’ll have to get your own employees, because we can’t have whites reporting to you.” So, I went and recruited three young, coloured females. Two of them, their uncle was in the new South Africa, the Minister of Justice, and his two nieces worked for me. I used to leave home in Paarl at 5:30 in the morning, and go and get to the office at 7 and do some work ’till half past 8, when these young kids came in, and trained them, etc. That was the start of a five year journey at Norwich Union. Sam: You left there in 86? Gregory: No, no. I left Norwich Union and joined National Mutual in 78. They were an Australian insurance company and they were brilliant. They had two Aussies who ran the place and in my first year, I actually for a while reported to a guy called John Day. I went and said to him, “I think you’ve made a mistake with my payoff.” He said, “no, no, no, it’s not,” he said, “I have been terribly disappointed that we’ve been underpaying you, and we weren’t paying you the same salaries we were paying whites. I’m just trying to get you to the same level as everybody else.” It was just mind blowing. I really enjoyed working for National Mutual in South Africa. I worked for them for eight and a half years. It was in 86 when they sold out of South Africa with all the pressures applied by the unions in Australia. That’s when I was offered the opportunity of, “do you want to be made redundant in Cape Town, or transferred to Melbourne?” I’ve always let the Aussies know I didn’t come voluntary, it was redundancy or Melbourne. Sam: And you chose Melbourne. Both my aunt and Mr. Gilfellen also made me promise that I would come back and bury them. That was 1986. It was still a great feeling of abdication. I was heavily involved in supporting people, and helping people, and helping families of detainees. I was vice-chair of the Western Cape Foundation for Community Work and we built 17 preschools throughout the Western Cape. To walk away from all of that was a strong feeling of abdication but at the time I felt that it was the right thing. Although I bawled my eyes out at the Cape Town airport when I left for this place called Melbourne. I remember February, 1986, sitting around the swimming pool in Paarl – in Paarl it’s 40 degrees. Friends of ours who had emigrated to Australia in 83, they visited in Paarl. I said to them, “you guys can run away to godforsaken places like Australia and New Zealand. I’ll never leave South Africa. I’ll fight the liberation struggle ’till the bitter end.” When I arrived Australia at the end of 86 this couple came and met us at the airport and said, “oh, we thought you were going to stay in South Africa forever.” So I learned you can never say never. But Australia was great. You can imagine leaving a state of emergency, leaving apartheid South Africa. In November 86 I sold my house in Paarl, and then arriving in Australia, and for the first time in my life I can go live anywhere. I can buy a house anywhere. My kids can go to any school. To the school ten doors down the road, my kids could go. I didn’t have to ask, in the restaurants, if I was allowed to come inside. I didn’t have to look for the signs on the beaches, and the buses, and the trains. Even today it sounds far-fetched, the life of apartheid in South Africa. Sam: Did you find yourself, not missing, but did you notice things that you released from that you hadn’t even noticed? Or is it so in-your-face that you do notice it, it is obvious? Gregory: Apartheid was like getting up in the morning, washing your face, and having a cup of tea. It was just so pervasive that it became normal. A lot of young kids, when I go and talk to kids will say, “but there were only six million whites, and there were 55 million of you. How come you didn’t just overthrow the regime?” But when have the political power, and the economic power, and the military might, then there’s very little that you can do. Sam: What word would you use to describe your feelings toward the system? Was it hate? Gregory: Yep. My aunt, when I went and saw her about leaving South Africa said, “Gregory, I don’t you – or your children- to grow up with the same resentment that you and your brother have for the system.” My brother and I – older brother, far more militant than me – we would discuss, maybe it was time that we went over the border and joined the ANC in exile. But we were Christians, grew up in a very strong Christian household, and so the issue of violence was something that we just couldn’t come to grips with. We wanted to fight the system, but we just couldn’t justify that people had to die in the process of us wanting to fight the system. But that resentment, and sometimes hate, was very strong when we’re in the midst of it. When you see your friends locked up with no trial. When my brother, who taught Sunday School in Cape Town in a place called Belgravia during the seventh riots in the seventies. We had the Trojan Horse incident when the police were hiding in the back of a van and then just shot at people. He buried a five year-old girl, shot three times in the head. There’s just thousands of those stories. Thabo Mbeki, who was South Africa’s Deputy President under Mandela and President for ten years, he sold as a novel what happened to his 17 year-old son. Kids used to just disappear. The stories in the Truth and Reconciliation Commission of how they used to either barbecue the bodies or chuck them in the river to be eaten by crocodiles. Yeah, “hate” is a strong word, but as much as I’d prefer it to be “resentment,” but I’d be lying if I said there weren’t times when I hated the regime, and hated the system. Sam: But not the people? Gregory: I think now, in hindsight, it’s easier to say it’s the system that I hated. At the time, it was most probably the people. The people who were the system. But, Dawie de Villiers, who was the Springbok Rugby captain, I met him here in New Zealand when I was Honorary Consul, and looked after him for three days. We went and spoke at a joint gathering and he was talking about the miracle of the new South Africa because he was one of the negotiators with the ANC. When it was my turn I said, “for me, the miracle of South Africa is this guy was the minister of a church – a university church- ten kilometres from where I lived and I couldn’t go to his church. He was preaching Christianity and inclusiveness but only to white people, and then he went into Parliament and became an MP. He was the oppressor and I was the oppressed. The miracle is we meet here on foreign soil, and we discover that the aspirations we have for our families are the same, and that the values we have are the same. We were just born on the opposite side of the track. That’s the great shame of South Africa. It took us 350 years to agree that all men and women were born equal, and that we would have respect for every single human being. As opposed to the arrogance of only a certain group was equal, or superior to everybody else. My aunt’s words of, “go to Australia” now I’m at a place where I totally understand it was the system, and the indoctrination of people through the system. Obviously there were leaders, there were architects of apartheid, who were responsible for this. The distance has helped with healing the wounds of resentment and hatred. I understand that there will be no future without forgiveness. I understand that when the world model was Nuremberg, and so many of us in the ANC thought, “yep, that’s the model to follow. Just get the bastards who’ve done this to us,” that Desmond Tutu and Nelson Mandela, and the leader of the Communist Party, Joe Slovo, pushed very hard for Truth and Reconciliation Commission. Thank God for those people who were genuine leaders. My brother, who stayed in South Africa, and lives in South Africa, probably doesn’t have the hatred anymore but the resentment is still there. I think the difference between us is I left the situation. Sam: That’s quite a massive thing to take. A massively divided community, an attempt to heal it, to say, “we’re not going to go down this revenge route, we’re going to go down a different route.” What can we learn from that about encouraging community change? Gregory: I think it all comes down to leadership. Firstly, I totally believe that Rolihlahla Nelson Mandela was preserved for such a time as this. If he was not in prison, he would most probably have died during one of the uprisings. The regime would’ve done away with him. Here was a man who had lots of time to reflect, and he was a different person that came out of prison than the one that went inside. He used to relate this to his children. He reminds them to go to Sunday School, that he went to Sunday School, that he taught Sunday School when he was at 14. His mother was a devout Methodist believer and I think that part of that spirituality that was in his mother was imparted to him, and he tried to do that with his children. What we needed was a leader who wasn’t going to shy away from doing the right thing. You can’t ignore the role that Frederik Willem de Klerk also had. A right-wing Afrikaner and a good Christian made in extending the hand. He read the February 1990 opening of Parliament speech. He came to power in 1989 when P.W. Botha was deposed and de Klerk came to power. He immediately – he was strong. And, together, him and Mandela won the Peace Prize in Oslo. Now, they never became good friends, but they were both people with integrity who understood that we need to extend the hands in order to bring about reconciliation. The number one issue has got to be leadership. People with courage, people with conviction. I judge, as a Christian, from a distance, and had views about Joe Slovo, who was the leader of the Communist Party. He was one of the great people in pushing for reconciliation and sunset clauses, and not wanting to go down the path of revenge And of course there was Desmond Tutu who screamed at apartheid South Africa then, and is screaming at ANC leadership today. Quite rightly so. You need people with courage, but the little [absent mentality], for instance. In 1995 – the Springbok symbol is a hated symbol in South Africa amongst blacks. So, today, a lot of black people still support the All-Blacks because blacks couldn’t wear the Springbok. And this guy called Precious McKenzie in New Zealand, who in the fifties was selected to go and represent South Africa, but was told he couldn’t wear the blazer with the Springbok on it, he’d get a separate blazer with a Protea on it. So, Precious, get rightly said, “get stuffed,” went to the UK, won gold for them, came to New Zealand and won so many Commonwealth golds for New Zealand. It’s only about eight years ago now that Precious was, in fact, inducted into the South African Hall of Fame. We all used to run to our TV’s at 11 o’clock at night to switch it off because we didn’t want to hear the Afrikaner anthem called Die Stiem. Again, in 94 many of us arrogantly assumed it would purely be called Nkosi Sikelel iAfrika anthem. But Madiba insisted that we were going to learn one verse of the Afrikaans, they will two verses of Nkosi Sikelel. We added a few lines in English. It’ll probably never be a musical masterpiece, but boy, it’s inclusive. If you lead, you also have to do the deliberate acts which then pull the nation together. Sam: You talk about Precious McKenzie. He gave a very inspiring speech when I was at school. You give such talks as well. What are you hoping to achieve by standing in front of a graduation, or a high school, whatever it is? Gregory: Papa Swan made a difference in the lives of three, so-called classified, coloured kids without a dad. Even in my wildest dreams would I have been the managing director of National Mutual’s corporate subsidiary in New Zealand, or Race Relations Conciliator, or Human Rights Commissioner, or Families Commissioner, or being on boards, and finding myself in a position of influence, but for the input of that old man, and my grandmother, and my mother, and the many people along the way who have helped me. For me, if I can inspire one, or two, or three young people to go on and make the difference, then that’s sufficient. Sam: Does it matter if you inspire them to make the wrong difference? Can you make a wrong difference? Gregory: Yeah, because right and wrong becomes a matter of opinion. So often I get people saying, “let me give you my unbiased view.” Our views our informed our upbringing, by the environment, by our exposures, etc. You just take the life of Fidel Castro, and the polls are all showing about 50/50 whether people believe he was a good leader or a bad leader. I think often it depends on the difference that he made in the lives of particular people. If, as a result of his actions, my family have suffered, then I will say he was a bad leader, and he made a bad difference. But, if my family have benefited, and we’re now living life to the full, then those people are going to say he was a good leader. It’s very, very subjective. I think, innately, for me, it’s about the difference in order to recognise that everybody deserves respect. The difference is saying, I have to encourage everybody because of our common humanity because we’re all inexplicably link and if I can encourage and support them then, at the very least, they can be able to fulfil their maximum potential, and operate at a level where the only barriers are themselves. It’s more when you inspire them to be the best that they can be, as opposed to saying, “I now commission you to go and be a pastor somewhere, or go and be a maths teacher somewhere.” You just want to encourage them, and almost, unleash the potential so they can be the best they can be without knowing. That old man who taught us, was there for us, he had no idea where we’d end up and the difference that my two brothers and I will and can make. He was just inputting into the lives of these three boys without expecting anything other than that was the right thing to do. Sam: There’s pictures here of you and your family, and Mandela. If you had five, ten minutes with Trump what would you say? From your experience, what would you- what message would you want? You gave a graduation talk that I found very inspiring, talking about working with people you don’t like. So, what would you do? Gregory: To the president-elect would be to say that, with great privilege, being the leader of, presently, what’s probably the most powerful nation in the world, the Chinese and the Russians will dispute that, but from a Western World perspective that’s a great privilege. But with it comes great responsibility and he was given many opportunities in his life. He failed at least four times, in being bankrupt, for instance. But, he was given an opportunity every time, whether it was his dad who helped him or the system that helped him in order to achieve. He owes it to his own legacy to ensure that every single person in America, and maybe the world, gets those opportunities that he has. That he needs to do that, without any view of what the colour of their skin is, what their religion is, what their country of origin is, but with a common humanity. He’s shown that he does enjoy having his ego stroked. If you say, “see the heights that you’ve achieved, but you had support in doing that, let your legacy be that you have supported the only people who when you were out on the stage you said you were going to be there for them. Be there for them, but let the them be defined the American preamble to the Constitution, which is all men and women were created equal, and that they all have inalienable rights. Because, some of the stuff that he uttered on the campaign: anti-particular religious groups, or anti-certain ethnic groups, etc. You still have to recognise that he’s been elected as the leader, because that’s the great thing about democracy. Is that you have a system. I mean, some of my friends are saying if Hilary or Trump were the best options that democracy throws up then who wants democracy. But, he was elected and in a democracy you have to accept the result, whether you like it or not. With Trump now being elected I think the challenge for the others is, “how can we help him to succeed in order for the people who we all beckon for? The people we all want to succeed, that they succeed under Trump?” Because he’s not going to go anywhere for the next four years. Sam: And, he’s playing to his crowd. Gregory: Oh, totally. I also think that his loyal followers are suddenly realising that Trump is his own person. I was just listening to Newt Gingrich the last few days, saying, “if he offers Romney the Secretary of State role, then he’s failing those of us who’ve loyally supported him.” But, Trump’s going to do what Trump wants to do, and maybe he’s playing Romney, and he’s playing everybody else. I don’t know. But I do think that he’s sort of been Trump by not doing what they’re all expecting him to do. Sam: Okay, we’re going to have to skip through to now. Gregory: Now I’m the National Director of Education and Employment with the Salvation Army. I was, sort of, in semi-retirement three years ago when I had a phone call saying, we’re looking for a Salvationist, but at the very least a Christian with business acumen. We’re in this new environment where the government is paying for performance and it’s not a place where the army have previously been, in that they used to get bulk money and they used to look at how can they help make a difference in the lives of the vulnerable and the marginalised. The environment’s different and we just need to rethink how do we make the mission sustainable. So I came here three years ago today now. Many people will say they failed mainstream; I say mainstream have failed them, because of the view that one size fits all. Maybe in ten years time we’re going to say did we do education sitting in a class? So for people who don’t fit that norm we have to do things differently. But there’s also social issues. There’s familial dysfunction, there’s alcohol, there’s drugs, there’s just so many other stuff that’s stopping them from achieving, and so when we get 40 weeks to give them an NCA level two or level three qualification; it takes 20, 25 weeks to get the car out the mud, then you have 15 weeks left to focus on can we get them 120 credits. I often find myself reminding the Salvation Army that this is why you exist, because you need to do something for those people, so it’s great. Sam: So your passion about making a difference and your business head have found a home in an organisation that’s committed to the lives of the vulnerable and marginalised. Sam: Why did it take so long? What are we doing wrong as a society that it takes a church to do that? Gregory: I don’t know. I don’t know why it takes so long. For me, if I wasn’t exposed to business and didn’t acquire the business skills of understanding what’s the drivers of revenue and what’s the drivers of my expense, and how can I make this mission sustainable, and then what is it that we need to do in order to make the transformative difference … Because in the end it’s not just about, as I jokingly said earlier, the academic buffaloes. It’s not just the NCA level two or three, but it’s also about the transformation of that whole person. That’s what we do. For the last three years I almost feel I’m doing what I was called to do, yet it’s taken me 50 years to get here. On the other hand, I don’t think I would have been as successful and as credible here if I hadn’t gained the business experience and if I hadn’t been exposed to the politics, and the struggles, and the issues of ordinary people. Maybe it’s the school of learning before you can speak with credibility and humble authority. Sam: So six quick questions to end with then. What’s the biggest success you’ve had in the last couple of years? Gregory: Most probably making education and employment sustainable within the Salvation Army. 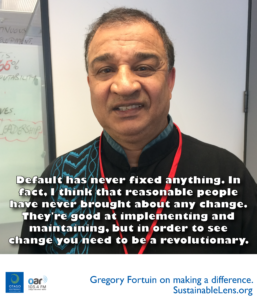 Gregory: Default has never fixed anything. In fact, I think that reasonable people have never brought about any change. They’re good at implementing and maintaining, but in order to see change you need to be a revolutionary. Gregory: Firstly, it’s faith in God. Sometimes I’ve been surprised that survived apartheid. It’s survived a house burning down, it’s survived a sad separation and so many other things, but faith in God would be the biggest thing. I’ve had a mother who poured everything into her three boys, for both my two brothers and I. We would never ever do anything that would disappoint her. And lastly, we were always going to show anybody in South Africa that we were as good as, if not better than, than they were. We just needed the opportunity. Gregory: It’s more being able to say no to the many things that I’m doing so that I can spend a bit more quality time with my grandchildren and my children. If anything, I need to ensure that, having lived the values that they understand them and that they will continue those values of wanting to make a difference. Sam: Is it going to be harder to get your kids and your grandkids to have that passion to make a difference, in that they haven’t come from that terrible position? Gregory: Yes. I often say to them, I wish you grew up on the farm that I did. The challenge is to be able to find a 21st century equivalent of my experience. But it’s been genuine, it’s been authentic, it’s them seeing me vulnerable, it’s them seeing me real that, warts and all, that will hopefully inspire them. Sam: If you could wave a magic wand and have a miracle occur tomorrow morning, what would it be? Gregory: That old man, Pappa Swaan, who was there for my two brothers and myself … We live in a country where three under-24-year-olds a week are killing themselves and committing suicide, so if I could wave a magic wand it would just be a mental figure for every single kiwi out there, somebody who’s going to be there at 2:00 a.m. in the morning when they ring and say, “I’ve stuffed up; I don’t know what to do.” Not judgemental, but still the strong guidance and the strong voice of encouraging and inspiring them. The magic wand is mentoring, but a genuine Pappa Swaan figure. Sam: What’s the smallest thing that we could do that would make the biggest impact in achieving that? Gregory: We have to be kind to each other. We have to love each other, and family matters. In August I was back in South Africa for my brother’s 60th birthday and then for two days mum and the three of us went away, just by ourselves, no wives, no kids. And for the four of us we couldn’t but reflect on it was 55 years ago when dad passed away, and mum as a 27-year-old with three boys, 4, 6 and 7 had to journey to … give her life in order for us to live fruitful lives. And 55 years on, here were the four of us at a resort, all over 60, still loving and enjoying each other and knowing how precious we were to each other. Gregory: We all have the ability to make a difference and we all have to discover our sense of somebodiness, and our sense of self-worth that in this modern world. People think that the challenge is in the fear of others. I think the challenge is knowing who we are, what we believe in, what our values are, and then being true to that. If we could just be true to ourselves and be kind to ourselves, and be kind to others, this will be a great world.